Gar Urette, CFA named one of Tampa’s outstanding wealth managers. Tampa, FL – Five Star Professional is pleased to announce Gar Urette, CFA, Garrison Asset Management Inc., has been chosen as one of Tampa’s Five Star Wealth Managers for 2016. Five Star Professional partnered with The Wall Street Journal to recognize a select group of Tampa-area wealth managers who provide quality services to their clients. Gar Urette, CFA is feature, along with other award winners in the September 12th issue. 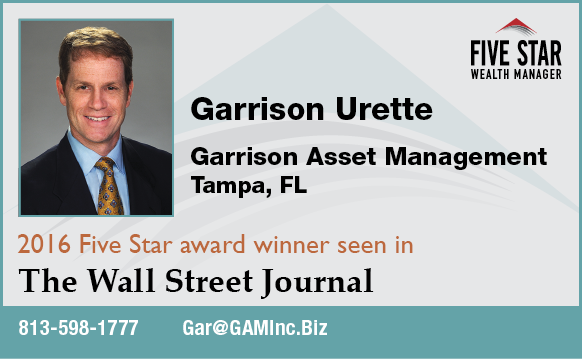 “Garrison Asset Management (GAM) was founded in 2000 as an independent investment management company. Based in Tampa, our company specializes in managing investment portfolios. We have a wide range of clients in both portfolio size and location. We serve large accounts as well as people that are just starting to invest. Our clients live across the globe and we travel the world to meet with them. Simply put, we work with people and business that shares our belief in quality and desire a stable return on their investment portfolios,” says Gar Urette, CFA of Garrison Asset Management Inc.. The Five Star Wealth Manager award program is the largest and most widely published wealth manager award program in the financial services industry. The award is based on a rigorous, multifaceted research methodology, which incorporates input from peers and firm leaders along with client retention rates, industry experience and a thorough regulatory history review. “The research behind this award is extensive with each wealth manager being thoroughly vetted from numerous angles. We are proud to showcase these distinguished professionals,” states Jonathan Wesser, Research Director, Five Star Professional. The Five Star Wealth Manager award, administered by Crescendo Business Services, LLC (dba Five Star Professional), is based on 10 objective criteria: 1. Credentialed as a registered investment adviser or a registered investment adviser representative; 2. Active as a credential professional in the financial services industry for a minimum of 5 years; 3. Favorable regulatory and complaint history review (unfavorable feedback may have been discovered through a check of complaints registered with a regulatory authority or complaints registered through Five Star Professional’s consumer complaint process*); 4. Fulfilled their firm review based on internal standards; 5. Accepting new clients; 6. One-year retention rate; 7. Five-year client retention rate; 8. Non-institutional discretionary and/or non-discretionary client assets administered; 9. Number of client households served; 10. Education and professional designations. Wealth Managers do not pay a fee to be considered or awarded. Once awarded, wealth managers may purchase additional profile ad space or promotional products. The award methodology does not evaluate the quality of services provided and is not indicative of the winner’s future performance. 921 Tampa wealth managers were considered for the award; 37 (5% of candidates) were named Five Star Wealth Managers. “To qualify as having a favorable regulatory and complaint history, the person cannot have: 1. been subject to a regulatory action that resulted in a suspended or revoked license, or payment of a fine, 2. had more than three customer complaints filed against them (settled or pending) with any regulatory authority or Five Star Professional’s consumer complaint process, 3. individually contributed to a financial settlement of a customer complaints filed with a regulatory authority, 4. filed for bankruptcy, or 5. been convicted of a felony. For research methodology information visit www.fivestarprofessional.com. Gar Urette, CFA named one of the financial industry’s innovators by wealthmanagement.com. New York, NY – Now in its 4th year, the 2018 Industry Awards recognizes the companies and organizations that support financial advisor success. Nearly 500 nominations were received from more than 300 companies in 2017, and 127 organizations were selected as finalists in May 2018. By recognizing outstanding achievement in the industry, the WealthManagement.com Industry awards will continue to inspire innovation and leadership among industry participants, creating an environment that will enable the industry to better support advisors in their roles as leaders to their clients and communities.